The basic concept here is that people have more than one legitimate “identity” in each importat context of their lives. 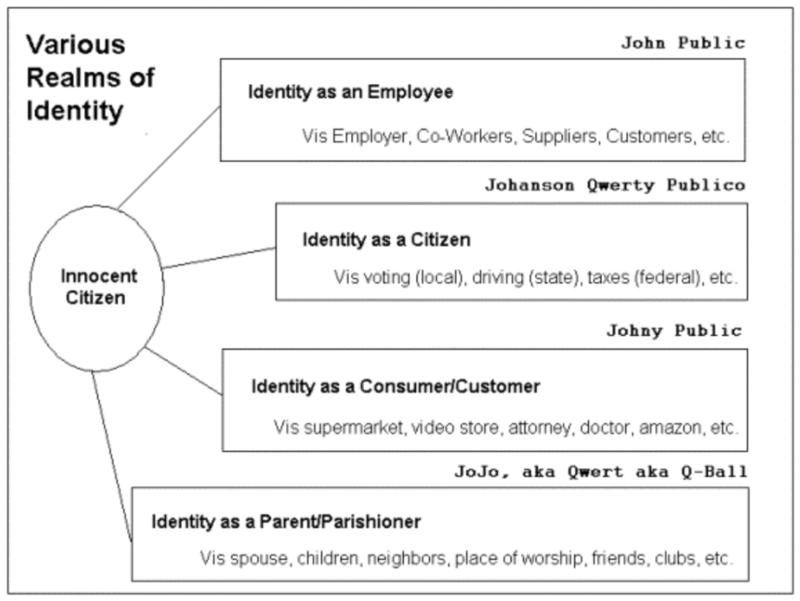 Below is a simple image from a 2002 “think piece” on common sense public policy and legal frameworks for identity management technology. The technology available at that time did not provide a workable method for individuals to have and use context-based identities that are primarily owned and controlled by others (eg government, hospitals, merchants, employers, etc) while maintaining a usable “core identity” of their own. Today, however, it is possible that the “address” used by individual users of the Bitcoin and Ethereum public blockchains can provide a technical method enabling “core identity” of this type. This CoreID.me open source project is exploring this potential through rapid prototype, convening stakeholders to evaluate/discuss and conducting a series of business, legal and technical assessment tests to start preliminary measure of the suitability of this approach to meet key requirements and other performance metrics. The following list of links collects some relevant pre-blockchain CoreID research and development work.